Over the past twenty years, Private Military and Security Companies (PMSCs) have become significant elements of national security arrangements, assuming many of the functions that have traditionally been undertaken by state armies. Given the centrality of control over the use of coercive force to the functioning and identity of the modern state, and to international order, these developments clearly are of great practical and conceptual interest. 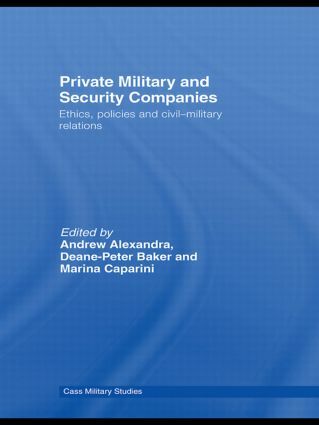 This edited volume provides an interdisciplinary overview of PMSCs: what they are, why they have emerged in their current form, how they operate, their current and likely future military, political, social and economic impact, and the moral and legal constraints that do and should apply to their operation. The book focuses firstly upon normative issues raised by the development of PMSCs, and then upon state regulation and policy towards PMSCs, examining finally the impact of PMSCs on civil-military relations. It takes an innovative approach, bringing theory and empirical research into mutually illuminating contact. Includes contributions from experts in IR, political theory, international and corporate law, and economics, and also breaks important new ground by including philosophical discussions of PMSCs. Of ‘mercenaries’ and prostitutes: can private warriors be ethical?